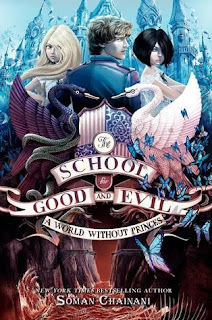 The second installment in The School for Good and Evil series opens on Sophie and Agatha home at their village. I did two rewinds on this, since the last book ended [highlight for spoilers, or skip to the next paragraph if you haven't read the first book, "The School for Good and Evil"with them being mysteriously spirited away from school to who knows where. They only went home? Ok fine]. But never fear, because Sophie and Agatha are figuring out that deviating from the typical happily ever after is having major repercussions on the school they left behind. In just a few chapters, they're back at school. But now, the school is split on gender lines - one for girls, and one for boys, thanks to fallout from Agatha's decision at the end of the first book. This installment does a better, clearer job of questioning gender norms and stereotypical fairy tale roles than the first. (Gender-swapping gnomes are an excellent touch!) The book still has a couple moments that struck me funny - a comment toward the end that felt a bit homophobic, and a pairing at the ending that has a very troubling age disparity, unless I missed something. Despite these off moments, the book as a whole challenges gender roles and emphasizes that importance of friendship. It works to find a balance between romantic and platonic relationships, acknowledging that each has an important role in one's life. We also get a bit more back story on each of the main characters that contributes to our understanding of them. Sophie especially comes into her own in this book, as we see her discomfort at her father's new relationship and more of her internal struggle to stay good. I'm downloading the final installment in this trilogy as I type, and can't wait to see where these girls go next. Verdict: Affirmed. Even with the occasional comment that seems to run counter to the overarching themes, the second installment delivers on its promise of exploring a strong female friendship in a fantasy world. "A World Without Princes" by Soman Chainani, published April 15, 2014 by Harper Collins. Audio narration by Polly Lee, published April 15, 2014 by Harper Audio.